A proven self-defense behemoth, with penetration and energy delivery unmatched in a handgun of similar size, the 10mm just got even better with the Barnes VOR-TX load. 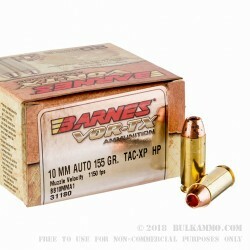 A speedy 155 grain all copper projectile that feeds and expands with the best of them. 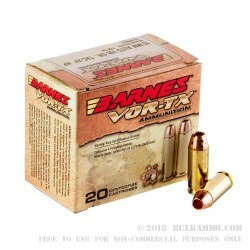 Now catching on as a medium game hunting handgun round, the 10mm release by Barnes in this line of cartridges is suitable for boar, deer, and other medium and small game as a handgun hunting load, with guaranteed expansion, serious penetration and proven delivery of energy at impact. 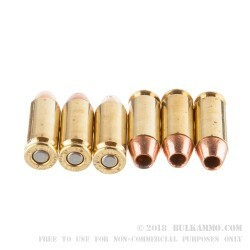 The projectile is a reliable feeder in 10mm firearms, and the brass case and boxer primer make it reloadable without too much difficulty. The precision quality control for the Barnes VOR-TX line means you can be assured that your accuracy will be improved and the quality of the components will be pristine. This load moves out of the barrel at 1150 feet per second and 775 ft. lbs of energy. 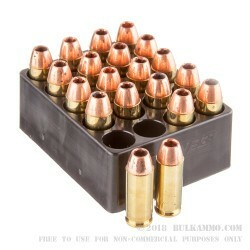 This makes it a potent and proven round for hunting or for personal defense.